This is the eighth year that the Standard Bank IT Challenge has been held; principally for Universities in South Africa. The Challenge aims to show both programming ability and teamwork with limited resources. Teams were made up of four members, one of whom acted as Team Manager. To ensure teams reflected the student population, and to create opportunities for more students, teams needed to include members from both genders and at least one member from a historically disadvantaged background. Each team was supplied with one PC only and access to a single printer. The heats were used to select the nine universities that would be invited to the finals. In addition, participating universities used the heats to select one team to represent the university. 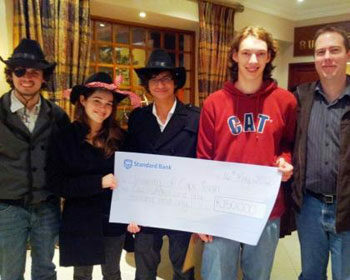 The teams competed at their own universities under supervision of a proctor from Standard Bank. The Challenge was judged by three judges: Julian Kenwood, Max Rabkin and Peter Waker. Peter Waker is a Fellow of the Computer Society of South Africa and acted as Chief Judge. Julian Kenwood and Max Rabkin set the problems. The final round was held at the Standard Bank Headquarters in the Johannesburg CBD. Teams from the highest scoring universities attended. As in the past, the names of the teams were intriguing. The team from the University of Limpopo had transport problems, and did not participate. SBCIB, was made up of local Standard Bank Corporate and Investment Banking employees. Participants were given 7 problems to solve: 1a, 1b, 3a, 3b, 4 and 5. Problem 5 was an “interactive” problem. All the problems, except 2b and 3b, were given at the start of the 6-hour competition. Problem 2b was issued as soon as a team had submitted 2a successfully and 3b as soon as 3a had been submitted successfully. Teams gained a point for each correct solution when tested against test data. The time to complete a successful outcome on a question was recorded. Teams earned time-penalties for submitting non-successful solutions. Three of the teams used Java, four used Python and two used C++. A breakdown of the submission by language used shows that of the C++ submissions, 54% were correct, while 28% of the Java submissions and 28% of the Python submissions were correct. However, these statistics may be meaningless as with so few teams the percentage correct submissions is determined by the strategy of the teams rather than the suitability of the language. • There were 89 submitted solutions of which 32 were correct – slightly lower proportionally than last year’s 32 out of 69. • Only one team managed to solve all the problems. • One team managed to solve problem 1a in 11 minutes. • One team did not solve any of the problems. • Seven teams were not able to submit valid solutions to the interactive question. • In the inter-team playoff for the interactive question, the SBCIB team managed to beat all. The winning team was selected according to the number of problems solved. If two or more teams solved the same number of problems, they were ranked according to the time taken. Teams earned time-penalties for submitting non-successful solutions; which explains why teams seem to have taken longer than the allocated six hours.